As a leading global designer and manufacturer of high-quality Close Circuit Television (CCTV) Cameras and control mechanisms, London based Overview Limited has an in-depth knowledge of camera control systems and a profound understanding of advanced electro-mechanical PTZ (Pan, Tilt, Zoom) control solutions. The company’s expertise and market leadership in these areas ensured that Overview was an extremely discerning customer when searching for a highly accurate vision measuring system for component inspection. Overview’s expanding product range and increased levels of production, have been driven by strong export sales, which had brought about the potential for bottlenecks occurring in the company’s Inspection department. To help avoid the prospect of delays, a decision was made to review the optical measuring systems available in the market. Mindful of the need to accommodate anticipated higher future production levels, the company considered systems that featured a larger measuring range, that could accommodate multiple parts with the added benefit of automatic CNC operation. Having applied the company’s CCTV and leading electro-mechanical systems knowledge to the review process, senior staff recommended the purchase of a Venture Plus, multi-sensing, CNC Vision Measuring System from Baty International. Xanadu Hewitt, Overview Operations and Quality Assurance Manager explained: “Overview Limited is a privately owned British company. We are the leading UK specialist designer and manufacturer of CCTV camera control mechanisms and CCTV speed dome solutions. “The reputation we enjoy is due largely to the quality of our products. To help ensure the reliability of the elements that make up our products – including mechanical mechanisms, electronics such as circuit boards and optical components – our components have extremely tight dimensional tolerances. “Also, as our CCTV systems are exposed to extreme weather, the highest standards of precision are applied to our housings to ensure outstanding sealing properties. “Amongst other activities, design, verification and assembly take place at our busy London HQ. Parts are shipped in from several worldwide sources; therefore we had a growing need for an accurate, optical measuring system for use in areas such as first article approval, design and mass production authorisation, and also for batch inspection. To allow us to scrutinise the maximum number of potential systems, we made a visit to the Control show in Germany. 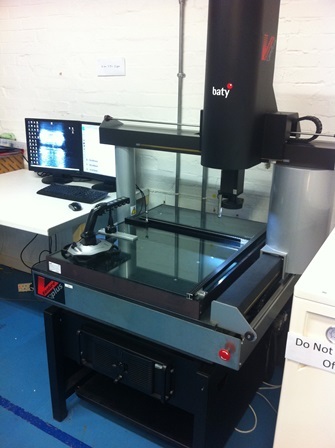 “Having rejected some of the available machines as they were unable to meet our challenging accuracy needs, and after being impressed by an excellent demonstration and by the specification, build-quality and ease of use of the Venture Plus, we placed an order with Baty International for a Venture Plus, CNC Vision Measuring System. “In addition to its advanced optical measuring capability, the Venture Plus has the advantage of a tactile probing system. The machine is also very easy to programme, we have now written part programmes and recall them when needed, enabling us to perform fully automatic CNC inspection routines. Baty’s software is very intuitive and provides all of the information we need, it also generates very useful statistics and allows us to electronically store inspection reports. Baty International is one of the world's leading manufacturers of Optical Profile Projectors, Co-ordinate Measuring Systems and Gauging Products. Baty's product range includes two dimensional, profile measuring equipment and full 3 dimensional coordinate measuring systems. Fusion metrology software has been the foundation for Baty's camera based inspection systems for more than a decade. The combination of ease of use, advanced edge detection and graphical reporting has ensured the continuing popularity of Fusion software. The use of Fusion renders CNC programming a simple teach and repeat process. By measuring a part in a straightforward manual mode, a full CNC program is automatically produced. The system’s zoom lens and fully segmented LED lighting system can also be controlled from software so that all magnification & lighting changes are recorded into the program, re-creating the same conditions every time a new component batch is measured. Baty’s Venture CNC models are able to automate the inspection process, advanced inspection routines, such as scanning and best fitting, can be achieved accurately and quickly with minimum operators input. Measurements from data points taken using the Venture Plus’s touch probe can be combined with those taken using video edge detection optimising speed and reducing inspection times. For more information the range of Baty Vision Systems click here.